Curator trashes authenticity of Wallace Hartley violin; biggest hoax since Hitler diaries? 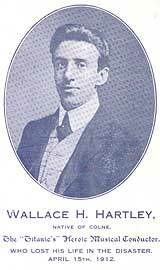 March 16, 2013 — THE CURATOR of the Titanic in Lancashire Museum has rubbished claims that Wallace Hartley’s violin has been found. 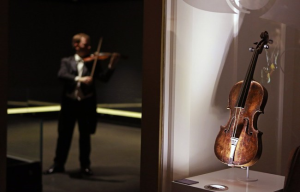 Titanic auctioneers Henry Aldridge and Son claim a violin played by Colne bandmaster Wallace Hartley on board the fatal ship is to go on display in Belfast at the end of the month. The instrument was discovered in an attic in 2006 and tests carried out by scientists are said to have verified it was Wallace’s violin. Andrew Aldridge, of Henry Aldridge and Son, said: “When we first saw the violin we had to keep a lid on our excitement because it was almost as if it was too good to be true. “The silver fish plate on the violin along with the other items it was with, such as the leather case with Hartley’s initials on, his jewellery and covering letter to the owner’s late mother, suggested it was either authentic or an extremely elaborate hoax up there with the Hitler Diaries. ‘We knew we would have to look into it and it couldn’t be rushed. Everything needed to be researched properly and the correct experts had to be commissioned. ‘We have spent the last seven years gathering the evidence together and have now reached the stage where we can say that beyond reasonable doubt this was Wallace Hartley’s violin on the Titanic. “We now know that minutes before the end he placed his beloved violin in this hard-wearing travelling case. But Nigel Hampson, curator of the Colne museum, said: “The historical record does not show that Wallace was recovered with his violin strapped to his body – it actually proves the opposite. “The inventory of items recovered on Wallace’s body makes no mention whatsoever of a violin or music case or anything similar being found with him. “We are supposed to believe that when the ship sinks and everyone, the band included, are fighting for their lives, Wallace is more concerned with the fate of his instrument than his life? “We are also supposed to believe that the violin survives almost two weeks in the sea and emerges intact? “The local press in Colne make no mention of his violin whatsoever. If Wallace had indeed been recovered with his violin after the disaster, they would have been all over the story and given it massive coverage. This entry was posted in Titanic controversies, Titanic insights, Titanic music, Titanic news coverage, Titanic Photos and Memoriabilia and tagged Henry Aldridge and Son, Hitler Diaries., Lancashire Museum, Nigel Hampson, violin, Wallace Hartley instrument on April 22, 2014 by kenrossignol.